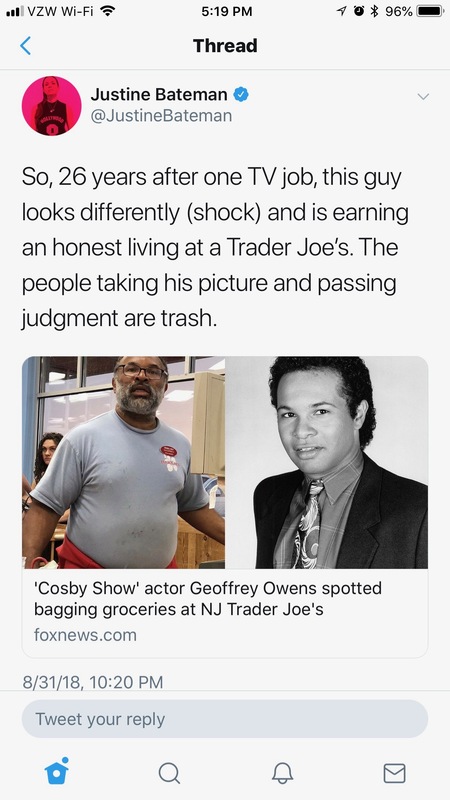 In case you missed the news a couple of weeks ago, Geoffrey Owens, the actor who played Elvin Tibideaux on The Cosby Show back in the ’80s and ’90s, was photographed while working as a cashier at a Trader Joe’s in Clifton, N.J. The photo was accompanied by unflattering articles on the Fox News website and the U.K.’s Daily Mail. I was heartened by the reaction to these articles: Many prominent people, including fellow ’80s TV star Justine Bateman in the tweet above (who asked his permission to re-post the grocery store photo), rose to Owens’s defense, accusing the photographer, the news media, and online gawkers everywhere of “job shaming.” The controversy even led to two new TV gigs for Owens: on a Tyler Perry-produced show and on N.C.I.S. I’m glad he can laugh about it! All’s well that ends well. Now allow me to get down off my moral high horse: I was one of those online gawkers. First, for some reason, I was surprised by the change in his appearance. As a first-generation viewer of the Cosby Show, shouldn’t “Elvin” remain that 20-something nebbish who married the stronger, more confident Sondra—as if—surprise, surprise—middle age doesn’t happen to all of us? Deeply unfair on my part, I know! Then I felt pity: “How the mighty have fallen! After all, he was on a number-one TV show for years, back when that meant something—back before the prime-time audience splintered into a thousand different pieces. But for now, I want to say a word about my second emotion: pity. Why did this photo evoke that emotion within me? Because I secretly believe, all evidence to the contrary, that assets like fame, popularity, career success, awards, good looks, money—all of which he surely possessed even as a supporting actor on the number-one sitcom in America—are life’s greatest treasures. Therefore, when I see him today, I see a man who lost everything. How could I not feel sorry for him? How tragic! But instead of feeling sorry for him, why not feel sorry for myself? Because my reaction to the image of the present-day Geoffrey Owens proves that I don’t believe the gospel of Jesus Christ the way I should. After all, hasn’t Jesus warned me not to lay up treasures on earth where moth and rust destroy and where thieves break in and steal (Matthew 6:19-24)? Hasn’t he warned me to be “rich toward God” rather than rich in possessions (Luke 12:21)? Hasn’t he told me that my greatest treasure by far is found in him (Matthew 13:44-46), and, indeed, that he doesn’t tolerate even a close second in anyone or anything else (Luke 14:26)? Yet I keep looking for my treasure outside of him. Why? How vain the king was to “set his nest on high, to be safe from the reach of harm,” as if it’s safe from the reach of God himself! Yet am I so different? While I won’t bother telling you what’s inside my particular nest, suffice it to say that I have one, and when it’s empty, I feel angry, insecure, and unsatisfied. Why? Is Jesus not enough for me? Unless or until he is, I’ll never be as happy in life as I want to be. As St. Augustine says somewhere, ‘God wants to give us something, but cannot, because our hands are full—there’s nowhere for Him to put it.’ Or as a friend of mine said, ‘We regard God as an airman regards his parachute; it’s there for emergencies but he hopes he’ll never have to use it.’ Now God, who has made us, knows what we are and that our happiness lies in Him. Yet we will not seek it in Him as long as He leaves us any other resort where it can even plausibly be looked for. While what we call ‘our own life’ remains agreeable we will not surrender it to Him. What then can God do in our interests but make ‘our own life’ less agreeable to us, and take away the plausible source of false happiness? Consider the apostle Paul. He doesn’t say, in Philippians 3:8, “I count everything as loss because of the surpassing worth of knowing Christ Jesus my Lord and doing the apostolic work to which he’s called me.” He counts everything as loss—even his work—in comparison to knowing Christ! This convicts me. Because I want Jesus and… This “and” makes me miserable. So I don’t know anything about Geoffrey Owens. But based on the evidence in the photo above, I have absolutely zero reasons to feel sorry for him. For all I know, he has Jesus (and he certainly has the opportunity to have Jesus), in which case he has a treasure far better than fame, popularity, career success, awards, good looks, and money. God, out of your great love for me, do what’s necessary to make me believe it. 1. C.S. 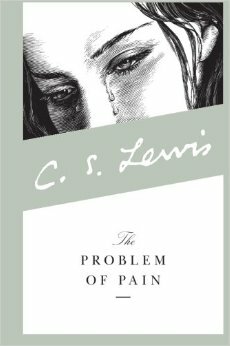 Lewis, The Problem of Pain (New York: HarperOne, 1996), 94. 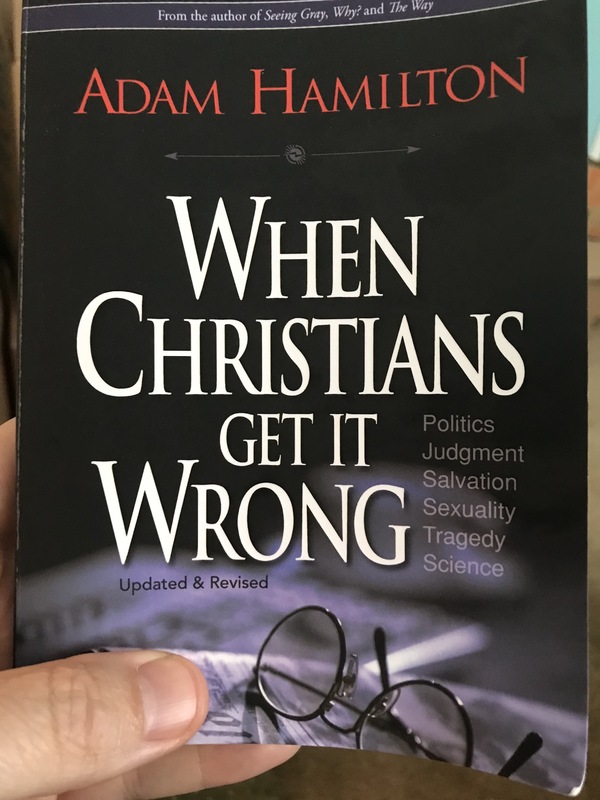 What’s wrong with a “Jesus Plus” kind of faith? Last Sunday’s scripture, Mark 5:21-43, is often called a “Markan sandwich.” The top piece of bread is Jairus’s meeting Jesus on the shore to ask him to heal his daughter and Jesus’ accompanying him to his house, in vv. 21-24. This plot line gets interrupted by the hemorrhaging woman. Her story, in vv. 25-34, forms the middle part of the sandwich. Finally, the bottom piece of bread is the resumption and conclusion of Jairus’s story in vv. 35-43. This literary device is characteristic of Mark’s gospel: See Mark 2:1-12; 3:1-6; 3:20-35; 6:6b-31, among many other examples. 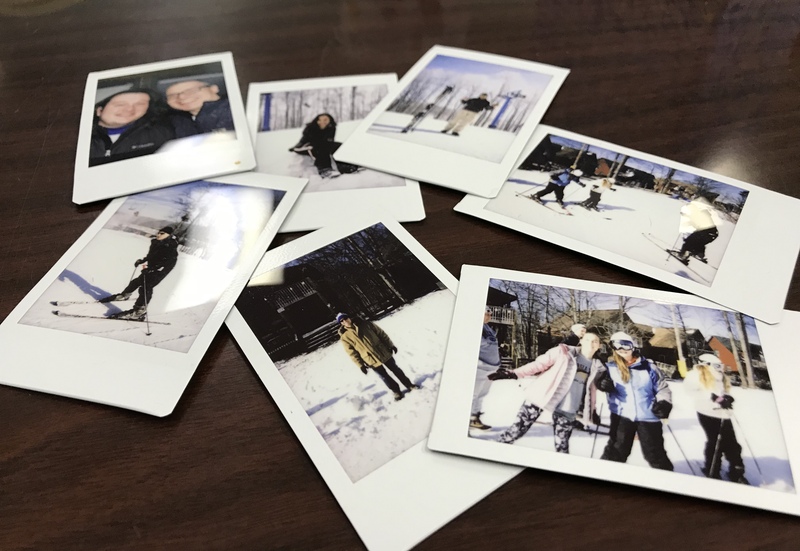 Mark tells his story in this way for two reasons: Not only because this is the way these events unfolded, but also because he wants the reader to see the interconnectedness of these two plot lines. As I said last Sunday, everyone, including the hemorrhaging woman, would expect Jesus to fulfill the request of a powerful, wealthy, credentialed, and respectable leader of the community: Jairus seems like a worthy candidate for a healing miracle of Jesus, whereas this ritually unclean poor woman does not. And yet, is Jairus really so different from the woman—social status notwithstanding? At first, it seems like it. While they’re both desperate for Jesus to perform a healing miracle, the woman has nothing to lose: She’s lost everything already. She’s exhausted all her options. She has nothing in her favor. And even if Jesus heals her, what credit will she deserve? She doesn’t even have the courage to ask Jesus for help. She intends to steal a miracle from him. 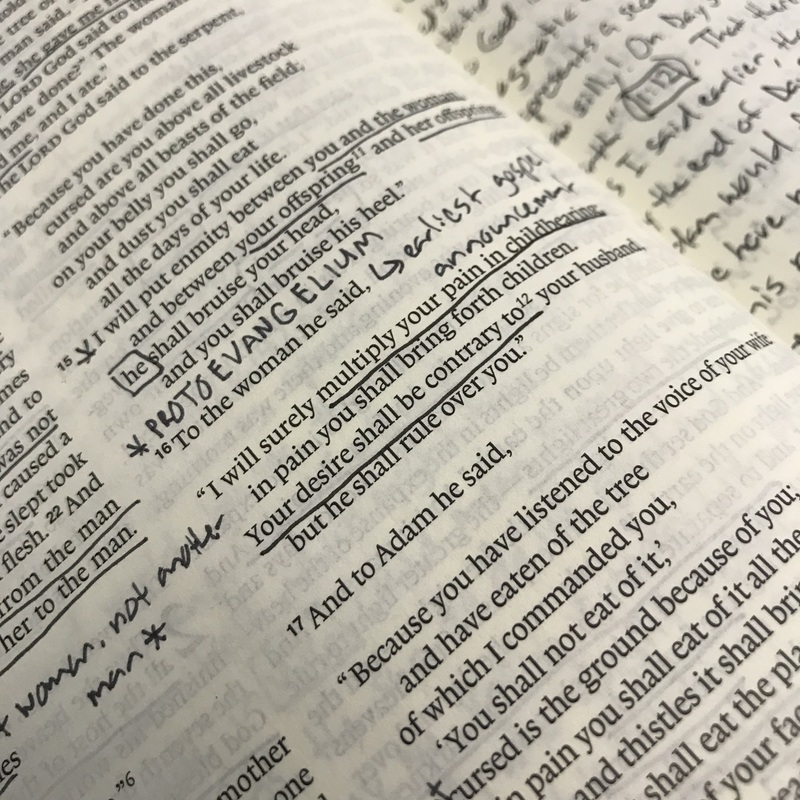 I said in my previous post that Jairus’s faith is far from perfect, and we can see why: Until the messenger delivers the fateful news in v. 35, he isn’t trusting completely in Jesus or depending on him completely. He’s also trusting in his favorable circumstances: “As long as my daughter is still alive, it’s not too late! I still have reason for hope!” Jairus’s faith was not in Jesus Alone: it was in Jesus Plus these other things. Easier said than done! I prefer to have a Jesus Plus faith rather than a Jesus Alone faith. I like being able to depend on myself, my circumstances, my vain belief that “things aren’t as bad as they seem.” In fact, what often passes for “Christian faith” for me is belief in my own power: the thought that I haven’t exhausted all my options; I haven’t worked all the angles; I haven’t called in all my favors—in which case my prayer isn’t that Jesus would save me—even if I mouth those pious words—so much as these favorable circumstances would save me, or these people who are well-disposed to me would save me. While Jesus often saves through circumstances and people—by all means!—I can easily forget that it is Jesus who does the saving; he is the One in whom I need to trust. And isn’t that the hard part? Not to worry, though: as I’ve learned from experience, Jesus will often test me until I remember that I have nothing and no one else to depend on except him. This is the “severe mercy” that Jesus shows to Jairus when he learns that his daughter has died. This is God’s discipline, and as painful as it often is, it is good for us! Think of this world as a place of training and correction and it’s not so bad. This is classic English understatement, perhaps, but I can only say, Amen! Hard luck stories… Everybody’s got them. Is that all they are, though? Hard luck? That’s just the way life goes, so get used to it? Not if the many promises in God’s Word are true. Hi, This is Brent White! 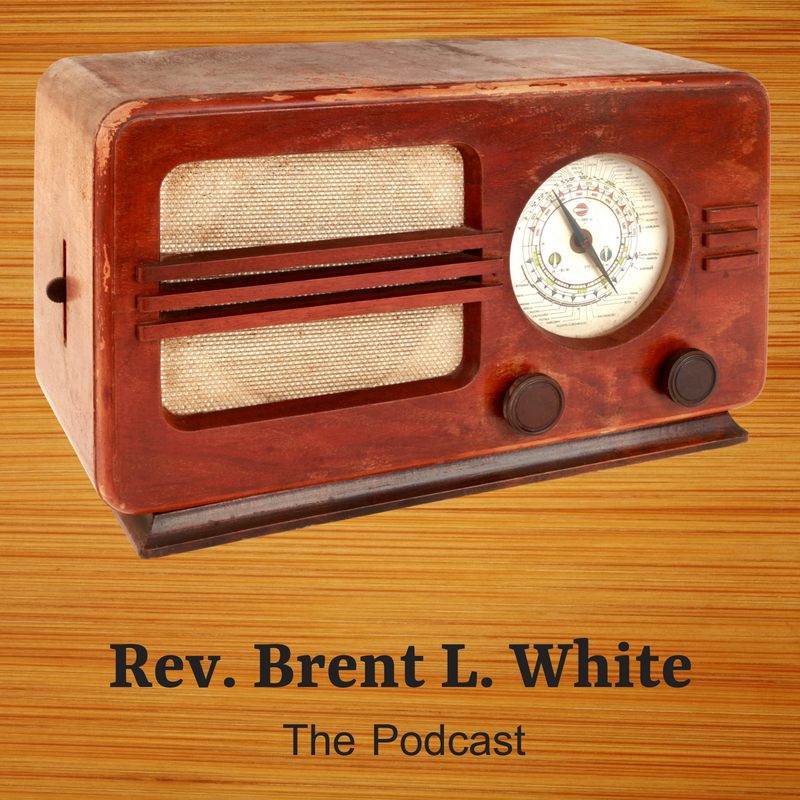 It’s Friday, March 9, and this is devotional podcast number 20. You’re listening to the song “Hard Luck Stories,” written by Richard Thompson and performed by him with his wife Linda on the duo’s 1975 album Pour Down Like Silver. Here’s why I’m playing this song: We all can tell “hard luck stories” about our lives. Of course, the song warns that the people to whom we tell them may grow weary of hearing them. Nevertheless, we all have them. But what do we make of them? Are they truly the result of “hard luck” and that’s just the way life goes? Not if God’s many promises in scripture are true. In today’s devotional, I reflect briefly on the life of Keith Green, who, along with two of his young children, died in a plane crash in 1982—doing the work of his ministry, naturally. Green’s life, as much as anyone’s, was characterized by the title of his second album, No Compromise. Hi, this is Brent White. 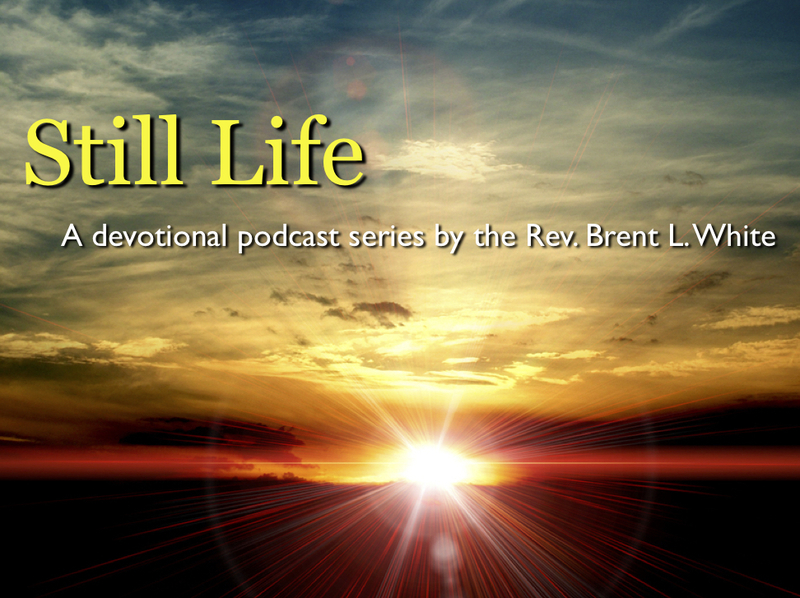 It’s Thursday, February 8, and this is Devotional Podcast number 13. This was late 1978. In July 1982, that baby, Josiah, now three, would be dead—along with his little sister Bethany and his father. They were killed in a private plane crash—while Green was conducting business related to his ministry. Keith Green was 28. And just like that, the life of this incredibly talented singer-songwriter—a musician whose first album Bob Dylan hailed as his “all-time favorite”—was snuffed out, along with the lives of his two young children. Of course, when he sang those lyrics he meant that he wanted to die to his old self—the “old man” that was crucified with Christ, as Paul says in Romans 6. He meant he wanted to lose his life for Christ’s sake so that he might find new, eternal, and abundant life. In a way, his deepest desire came true in July 1982. He and his two children—and everyone else who died in that plane crash—are at this moment experiencing a kind of life that we can only dream of—a life that’s waiting for all of us who are in Christ on the other side of heaven. C.S. Lewis once said every deathbed is a monument to a petition that wasn’t granted. What he meant was that nearly every time someone dies, there’s someone else—a family member, a friend, a spouse—praying that that person would be healed, that that person would live. When I preach funerals these days for people who I know were believers, I often ask the congregation to imagine what that person would say to us if he or she were here with us now. And I often point out that I make a living talking God, talking about his Son Jesus, talking about his grace, his love, his glory… It’s what I do. I’m a pastor. But whatever I think I know right now about these things… [scoffs] it’s baby talk compared to what this person who now lives directly in God’s presence knows… It’s baby talk by comparison! Would we follow Christ with that kind of dedication if, as with our brother Keith Green, it meant our death within a few short years? Or do we put heroes of the faith like Green in a special category—his example is too lofty for us. But we don’t get it… There’s just one category in which all of us Christians belong. If we are Christians at all, that means we sign our death warrant; it means we carry our cross—that instrument of torture and death—even if it leads us up that hill to Golgotha—for no servant is greater than his master. And even if it kills us—physically—we are supposed to be O.K. 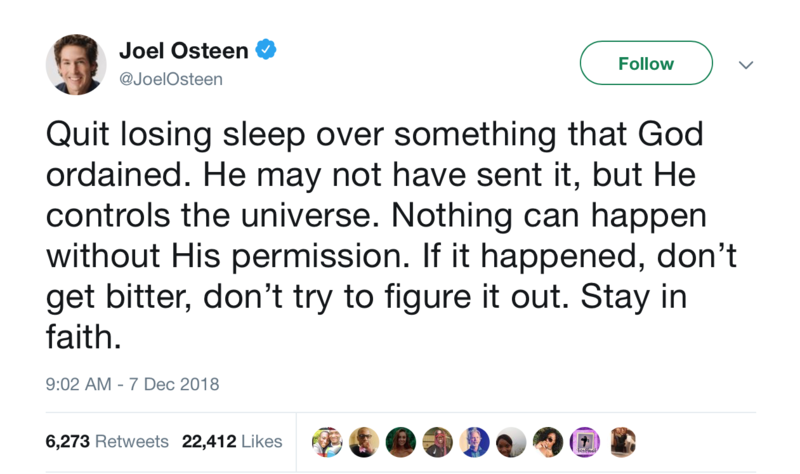 with that—if that’s what Jesus wants for us. Is that too extreme? Is that asking too much? If so, maybe being a Christian isn’t for us—because Jesus asks his followers for nothing less! 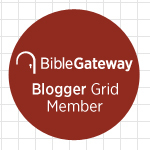 I used to think, “Where’s the grace?” Isn’t that so perfectly Methodist of me… to ask that question? Where’s the grace? When we confess our sins and repent, by all means, God’s grace will be there. Why should we expect it a moment before that? Brothers and sisters, Jesus wants everything that we have. Do we believe that if we give everything, it will be worth it? If not, why not? If so, what’s stopping us?